Alina Ming Kobialka performed the Mendelssohn with the Las Vegas Philharmonic. Las Vegas Review-Journal: "…the evening’s guest artist, violinist Alina Ming Kobialka, gave a clinic in technique that left the large Reynolds Hall audience wildly enthusiastic and calling for more." Itzhak Perlman performed the Beethoven with the Tucson Symphony Orchestra. Arizona Daily Star: "...it was how he performed Beethoven's Violin Concerto in D major that was so breathtaking. He made it seem so effortless. His hands moved with the fluidity of a ballet dancer in a graceful pirouette." Hilary Hahn performed two Mozart concertos with the Toronto Symphony Orchestra. ConcertoNet: "Ms. Hahn handled it all with total aplomb, rendering the work not just beautiful but worthy of serious contemplation as well." Sarah Kwak performed the Wieniawski's Second Violin Concerto with the Oregon Symphony. The Oregonian: "Kwak tore it up in a performance as dazzling as any recent star guest soloist." 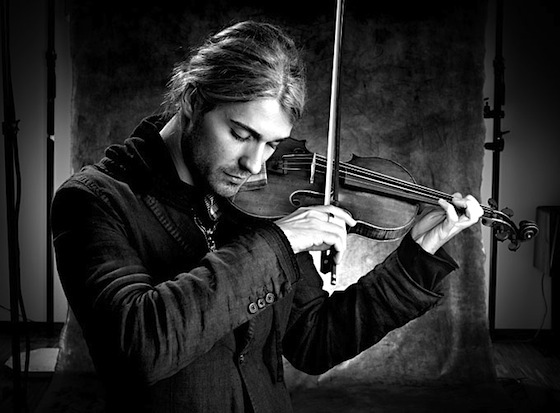 David Garrett performed in concert in Dallas. Diana Cohen performed the Barber with the Calgary Philharmonic Orchestra. Calgary Herald: "Cohen executed her solo part with great élan, her playing effortless and filled with generous tone and refinement." Nancy Zhou performed the Dvorák with the San Antonio Symphony. San Antonio Express-News: "The star musician of the night was San Antonio's own, violin soloist Nancy Zhou, 20, now based in Boston as a student and international performing artist." Correction: Nancy Zhou is 21. Her performance of the Dvorák Concerto with the San Antonio Symphony was indeed lovely. It is always a privilege to experience her artistry. Eric, thanks for letting us know, seems like there are a lot of mistakes in the reviews across the country this week. Post-holiday blues? Polar-Vortex fever? I'm glad you were able to hear her play live as well!